This concept came from a desire to bring into alignment the Nautilus desktop website with the mobile website. The goal was to create a mobile design that was a natural pairing-down of the full desktop experience. 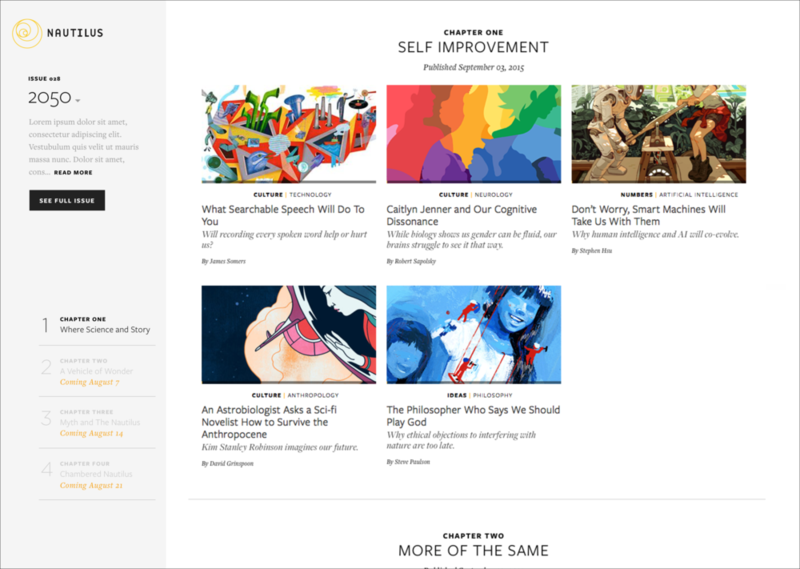 This concept was an attempt to focus the Nautilus reading experience on content. The design employs a book-like table of contents along the left, and immersive content both graphic and text on the right, moving down in a continuous scrolling fashion. Begins with a cover illustration associated with the theme '2050' (near future). Next we see a grid of content whose order and choosing would be determined by an algorithm or manually edited. Lastly is a linear list of chapters, as appears in the table of contents along the left. Each chapter is followed by the next. A significant percentage of traffic to Nautil.us had been moving toward mobile when we decided to port our full desktop experience to a mobile site that was more suited to mobile-sized screens. A very similar version of this is what made it to final production.